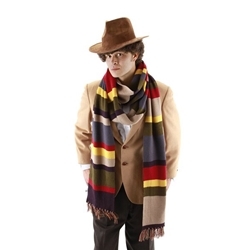 This isn't an ordinary multicolored scarf- in the hands of the capable Doctor, it's a lasso, measuring tape, and almost always saves the world from impending doom. While the original was knitted for the Doctor by Madame Nostradamus, ours is made from soft 100% acrylic. 12 feet long. This item is officially licensed by BBC Worldwide Limited.